Three members of the IKOKC attended this prestigious annual event in New York City on Saturday, September 28th. Sensei Tats Nakamura (coach & official), Mark Berg (competitor) and Stuart Corrigal were witness to one of the best Kyokushin tournaments of the year. The level of competition at this event always draws elite competitors from around the world, but 2013, saw competitors from over one dozen countries. 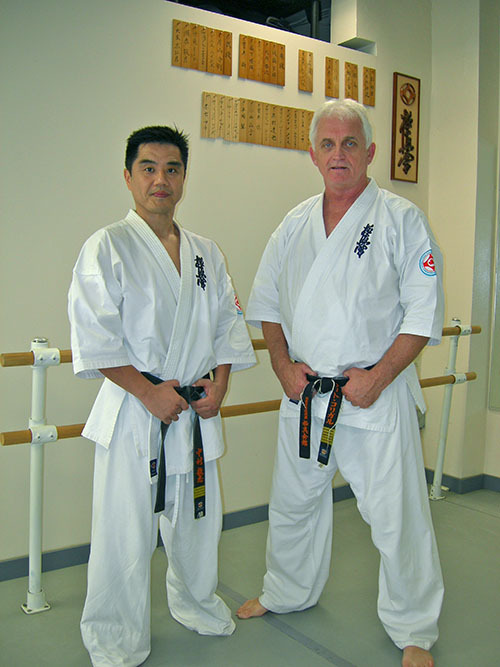 Many of the participants are veterans and well-seasoned competitors on the international Kyokushin tournament circuit. Friday afternoon, the day before the main tournament event, officials gathered at the New York City Kyokushin Karate dojo to practice and refresh their previously acquired officiating skills. An officiating clinic before any IKO event always brings many benefits. This year was no different, as the officiating on tournament day was at a very high level, which contributed to the high level of the 2013 event. Mark Berg, the solo competitor representing the IKOKC was up to challenge in his two fights. First off, Mark faced a seasoned competitor from the Ukraine, Vusal Ismailov. Mark was able to defeat his opponent with a strong showing. Mark’s next opponent was formidable, Zahari Damyanov, from Bulgaria, one of the tournament favorites. Mark gave a very good showing of his abilities, but Damyanov’s experience showed and Mark lost on the judge’s decision. Damyanov, went on to become the tournament champion and received the award for “Most Technical Fighter”. The tournament final featured, Damyanov and Russian fighter, Darmen Sadvokasov. Without a doubt, one of the best Kyokushin matches witnessed in any Kyokushin tournament for a very long time. Sunday morning at the NYC Dojo, an IKO training seminar was led by Kancho Shokei Matsui, which covered many different aspects of Kyokushin Karate. A very full and exciting weekend of action, but more so, a very successful Kyokushin event. This entry was posted	on Tuesday, October 1st, 2013 at 6:17 pm	and is filed under Uncategorized. You can follow any responses to this entry through the RSS 2.0 feed. Both comments and pings are currently closed.